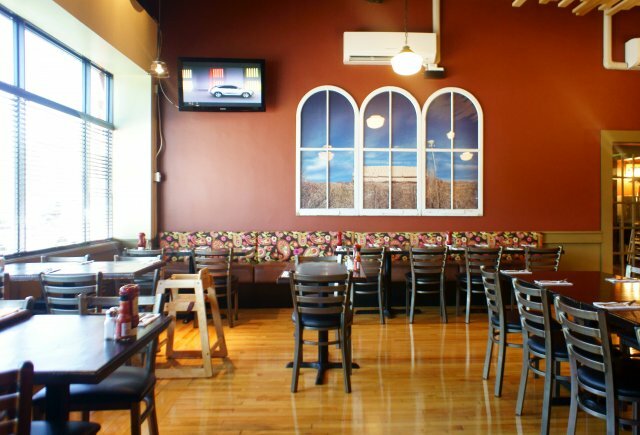 Smoke & Spice outgrew its popular space on Ottawa Street last year and moved into the former Montana’s at 7470 Tecumseh Road East in January. 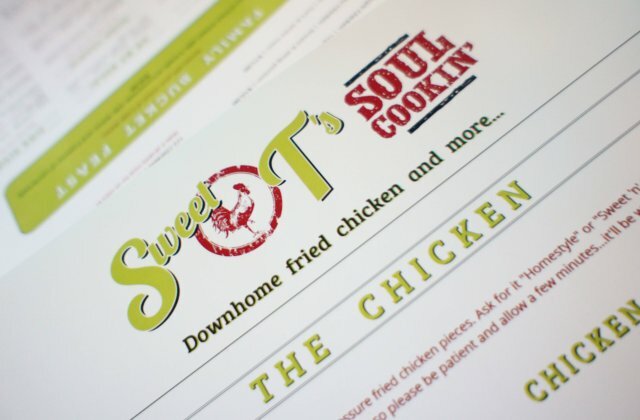 The owners had been planning a new concept for the former spot at 1515 Ottawa Street and this finally took off this weekend as Sweet T’s Soul Cookin’, a fried chicken restaurant. 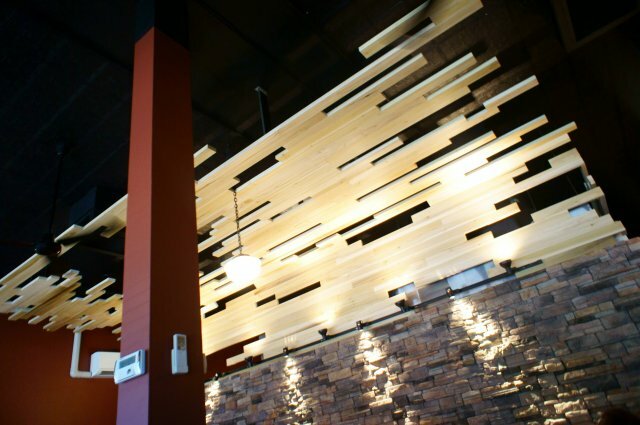 Five months after Smoke & Spice moved out, the interior has retained much of the same layout with certain changes to the walls: fresh paint and new colours, an exciting wood patterned ceiling and graphical wall paintings. 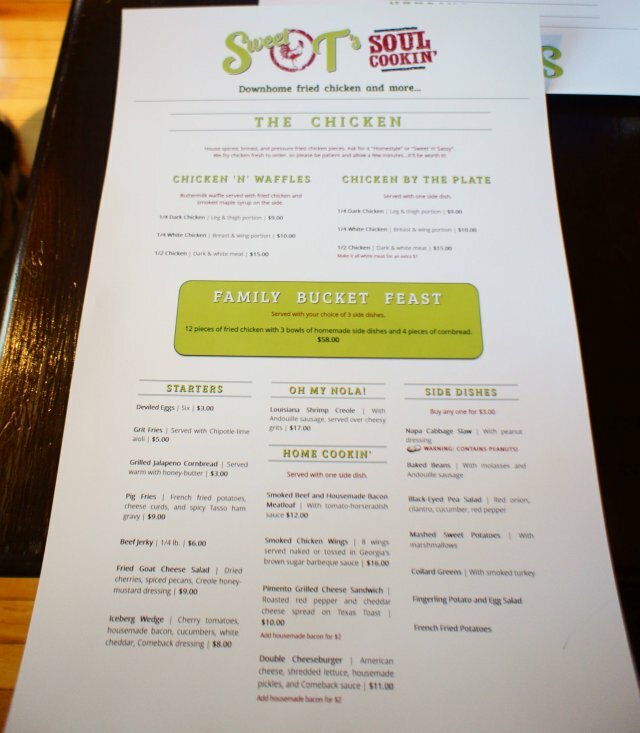 While Smoke & Spice was a pork restaurant, Sweet T’s Soul Cookin is destined to become the place to go for chicken in Windsor. 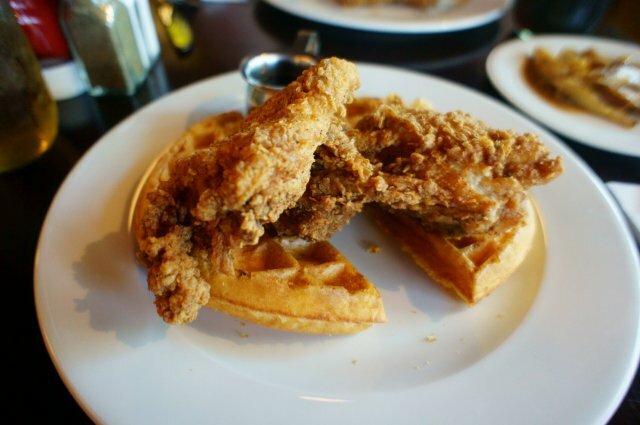 Billed as “Downhome fried chicken and more”, Sweet T’s has all sorts of southern favourites like Chicken and Waffles, quarter and half chicken plates (white: wing and breast / dark: leg and thigh), family buckets, and of course wings. 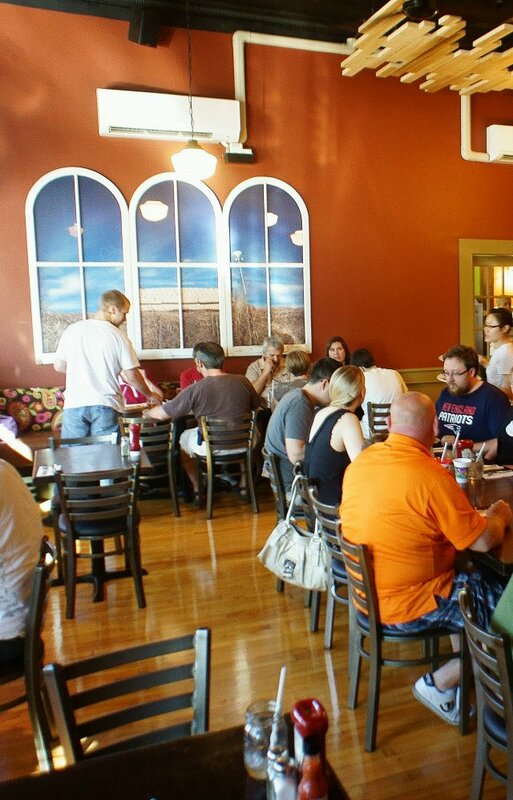 Starters include deviled eggs, beef jerky, french fries with cheese curds and spicy Tasso ham gravy, a fried goat cheese salad and grilled jalapeno cornbread among others. 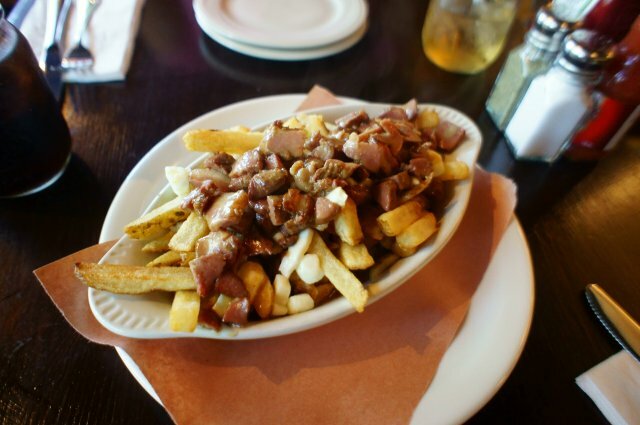 Pictured: “Pig Fries”. 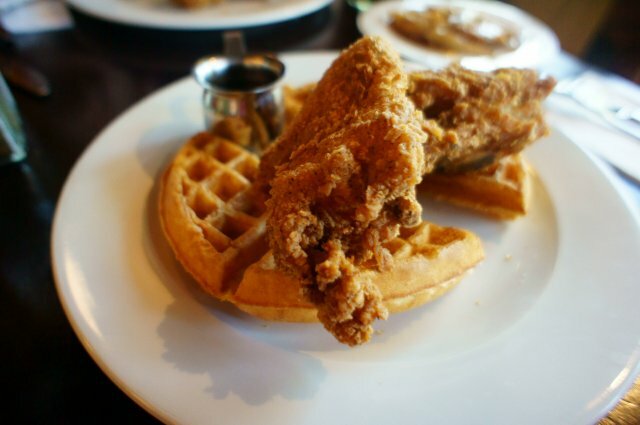 Pictured: white meat chicken plate, prepared “Homestyle”, served with waffles with real, smoked maple syrup. 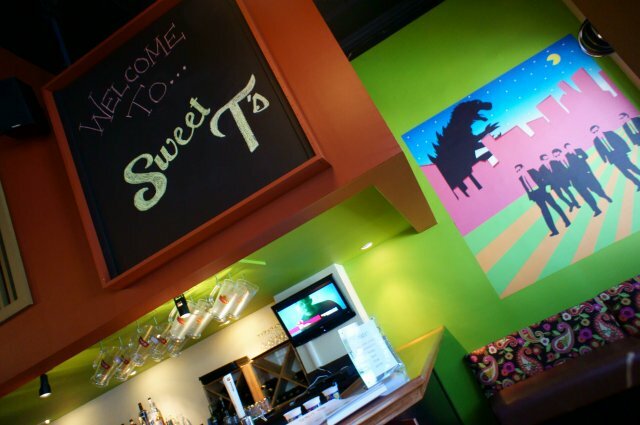 Other entrees include a Lousiana Shrimp Creole with Andouille sausage served over cheesy grits, Smoked Beef and Housemade Bacon Meatloaf, Smoked Chicken Wings, a Pimento Grilled Cheese Sandwich, and an American cheese, shredded lettuce, housemade pickles, and “Comeback” sauce cheeseburger. 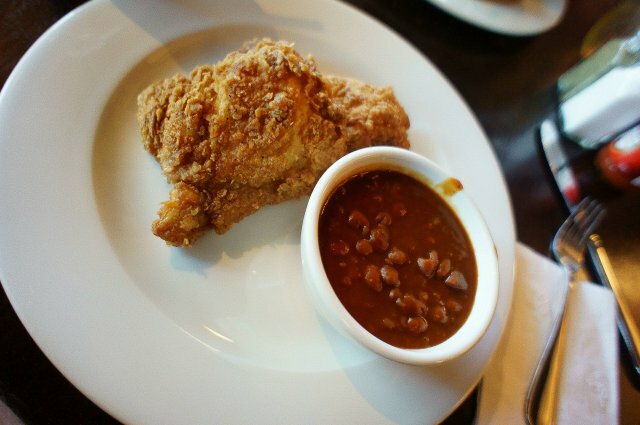 Pictured: dark meat chicken plate, prepared “Sweet & Sassy”, served with a side of baked beans. Other sides include a Napa Cabbage Slaw with peanut dressing, a Black-Eyed Pea Salad, Mashed Sweet Potatoes, Collard Greens with smoked turkey, potato and egg salad and french fries. 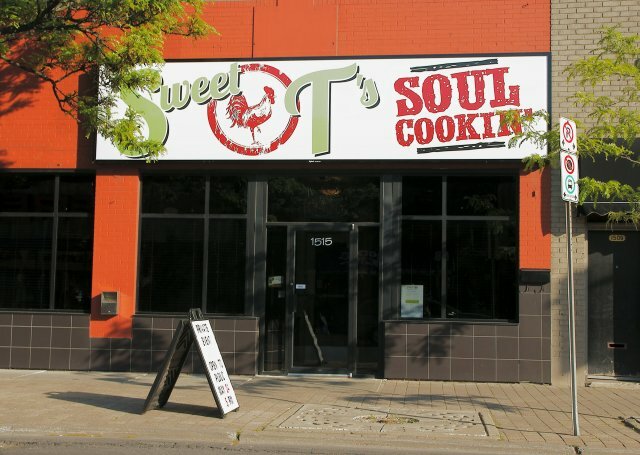 Sweet T’s Soul Cookin’ is officially open to the public as of Thursday May 24th at 1515 Ottawa Street.